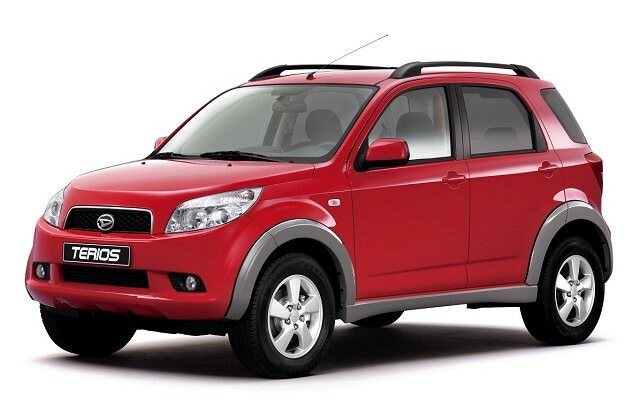 A small, cute but rugged-looking SUV that's tall and narrow, the Daihatsu Terios is at home in town or the country. A small, cute but rugged-looking SUV that's tall and narrow, the Daihatsu Terios might have been conceived for Japan's narrow city streets, but it's just as capable out in the rough. Surprisingly so given its compact dimensions. There's not a huge demand for the Terios, as it comes with many compromises for its ability, but if you need a small, capable SUV then it might just suit you. A car that's designed to eke out maximum interior space despite a small physical footprint, the Terios is tall and narrow - quite comically so from some angles. Yet underneath those slightly odd looks is a rugged little SUV of decent ability, the four-wheel drive models even coming equipped with a central locking differential. That'll mean it'll travel where tractors would usual dominate, though for those less likely to get it axle deep in muck there's a two-wheel drive version, which benefits economy a touch. The interior is surprisingly spacious, though the usefulness of the boot is slightly hampered by a side-opening boot door, which makes gaining access tricky in tight spots. Daft really, as tight spots is where the Terios excels, its high driving position and upright stance giving it a useful view over the traffic that similarly-sized rivals don't offer. The plastics fall into the 'tough and hard-wearing' category, rather than soft and tactile, but that should mean it'll put up with all sorts of abuse. The only engine choice is a 1.5-litre four-cylinder petrol unit, mated to either a five-speed manual gearbox or a four-speed automatic. All should come with alloy wheels and air conditioning, as well as an adjustable steering wheel. There's a mix of two- and four-wheel drive Terios in the classifieds, but if you're going for its rugged looks then you might as well have it with all its ability. So the 4wd model in manual guise is the one we'd choose. The Terios is a car that's very much fit for purpose, if that purpose is a second car and you happen to live up a nasty farm track. Sure, its appeal is limited, but for a handful of people out there it fulfils a role that little else can, though you pay heavily with high emissions and poor economy.